Visitors to Telluride enjoy the myriad of music festivals, including the famous Bluegrass Festival, unique gondola transportation system, world class skiing, hiking and biking and renowned film festival. Telluride’s earliest beginnings weren’t quite so feted or world famous. Telluride’s earliest residents were members of the Native American Ute tribe. The Telluride valley’s San Miguel River made an ideal summer base area for the tribe to hunt the numerous elk, deer and mountain sheep that visited the water and the fertile surrounding areas. The Utes remained in the valley until explorers from Spain and European fur trappers started exploring the area in the 1700s. The Spanish didn’t find the rugged high altitude of Telluride hospitable and did not establish permanent settlements. The fur trappers quickly exhausted the beaver population due to the extreme popularity at the time of the of the fashionable beaver hat. The next wave of visitors were the miners. 1875 saw the first mining claim in Marshall Basin, located just above today’s Telluride. The area was found to be rich in zinc, silver, copper, iron, lead and gold, leading to a steady migration and eventual population boom. The resulting town was first called Columbia but the United States Post Office wouldn’t grant the town its own postal branch due to their already being a Columbia in California, so the town eventually was re-named Telluride. Whether the name derived from the mineral tellurium or if it was taken from the sendoff given to those who continued on elsewhere to seek their fortune, “To Hell You Ride!” is still in dispute by those in the know to this day. With the construction of the western railroad, Europeans and Chinese immigrants flocked to Telluride. By the end of the 19th Century, the town swelled to 5,000 and boasted amenities for the population along with less wholesome pursuits of saloons, gambling and a red-light district. Infamous celebrities of the day including Butch Cassidy had Telluride in their sights, committing brazen robberies and general mischief. In 1891, Telluride became the first town in the entire country to get electricity. The mining boom ended early in the 20th century and the population dwindled as men left the diminishing mining industry to seek their fortunes elsewhere. Many also left to join the military to fight in World War I and didn’t return. By the 1960’s Telluride was a virtual ghost town with a mere 600 residents. Held over Labor Day Weekend, the Telluride Film Festival was founded in 1974 by film loving locals and the Telluride Council for the Arts & Humanities. This small town film fest has grown into a not to be missed destination for Hollywood and filmmakers of every stripe and genre, from every corner of the globe. Premiering your work at Telluride is a Big Deal. There is not an actual competition; films enter the festival to gain prestige, fame and publicity. Held every summer solstice weekend, the official beginning the Colorado Summer, the Telluride Bluegrass Festival brings an incredibly eclectic collection of artists from all over the world representing a wide array of musical genres together to bring a truly one of a kind experience to music lovers, all sprinkled with the flavor of the original folk and bluegrass tradition, which had its first unveiling in in 1974. Telluride is a unique blend of the Old West and modern world class resort. 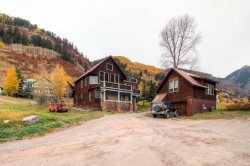 One of only four communities to receive the National Historic Landmark District designation in Colorado, Telluride embraces its rich history and architecture and cherishes its small town mountain lifestyle. Hiking around the town, you are likely to encounter remnants of the area’s rich history. Don’t be surprised to stumble upon long abandoned mining equipment or ramshackle mining sheds barely standing in the words. At the same time, visitors are able to experience luxurious world class resort amenities. Telluride has been able to meld its unique history into its present day persona, making it, in spite of its somewhat remote location, a must-visit mountain destination. For more information on the history of our town, don't miss the Telluride Historical Museum located at the top of North Fir Street.